I’m not one for exuberant displays of colour. This garden is too small. However in these months of short days and dark evenings, part of me yearns for something a little cheerier than the browning and decaying foliage which greets me on my daily inspections. So I’m looking back at brighter times, when sometimes by design but often by accident, something occurs which takes me by surprise. I’ve been browsing online bulb suppliers for tulips which will satisfy my somewhat puritan colour tastes. And this has reminded that a couple of years ago the garden was graced with the unexpected appearance of what could only be described as salmon pink. I did not plan this, but made the best of it. The Autumn before, Sarah and Brian returned from a trip to Amsterdam with the gift of tulip bulbs. I planted them in a pot on the terrace and awaited their spring display of white and green. Their failure to deliver what was promised on the packet meant that we were forced to live with a colour I would normally have avoided. Consolation and some solidarity was provided by the old Pieris, bravely attempting a comeback after its near annihilation by the construction of the wall. It’s new growth was almost the same colour as the tulips, and provided a sympathetic balance. I kept the pink tulip bulbs and was treated to a second display this spring. 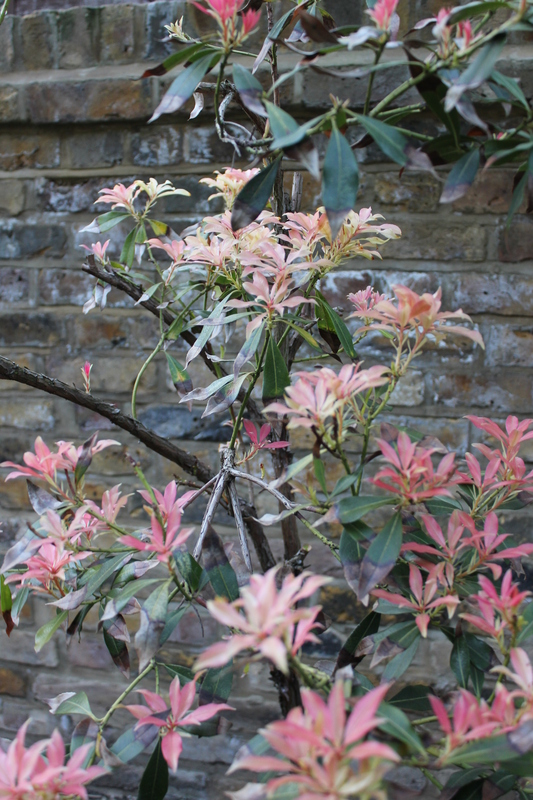 However, the poor old Pieris didn’t recover from the trauma of the wall construction, and died shortly after its brave final flourish. So without its contribution, the sudden appearance of the pink did not seem to work as well. After they faded, I removed them and decided that for following year I would contrive a more controlled display from my spring bulbs. 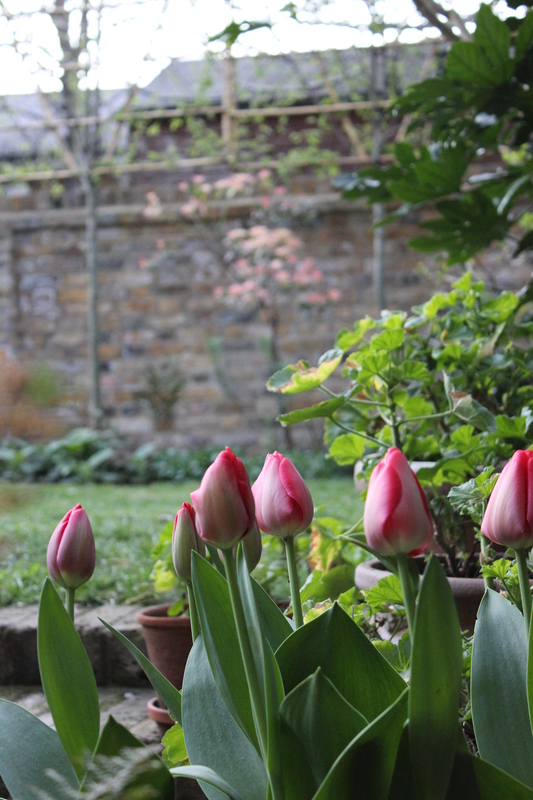 So, inspired by the almost endless choice and extraordinary good value offered by Parkers Bulbs, I have chosen two tulips more for their shape and demeanour than for their colour. The first that caught my eye was Tulipa Madonna, a parrot variety in palest creamy white with a flame of green and a flouncy style. In contrast to this, I will plant the more restrained Tulipa Purissima ‘design’ which has a deeper cream colour and an altogether more refined attitude. These, I am told will flower in April or May. So they will sit very nicely alongside the Naricissi Thalia which are already occupying two large pots. With this in mind, and because you can’t have too many spring bulbs, I bought fifty more of the Thalia which I intend to distribute amongst the beds. Finally, and in a bid to introduce a little more verticality, I found that Parkers would also be able to provide bulk supplies of a bulb I have been meaning to increase in number for a while and always forget about at the relevant time of year. That is Camassia Leichtlinii Semiplena. I can’t actually remember where or when I bought the few I have, but on their first flowering I realised I needed more. These beautiful spring stars flower for too short a time, but when they do, their delicate illumination brings the garden alive. Camassias do need space around them, but the few I have seemed to be getting a little crowded by the neighbouring hibiscus. So this summer after their flowers had faded, I took the risk and moved them to fill some of the gaps in the rear bed. Camassias originate from North America, where they grow in damp meadows or along streams. I am hoping that their new location at the shadier end of the rear border will suit them well. By the time the sun is high in the sky, they will have flowered and faded, and the earth around them will be shaded by the burgeoning leaf canopies of the silver birches and the hornbeams. But in spring, when they light up the shadier corners of the garden, their increased numbers will, I hope, be spectacular. 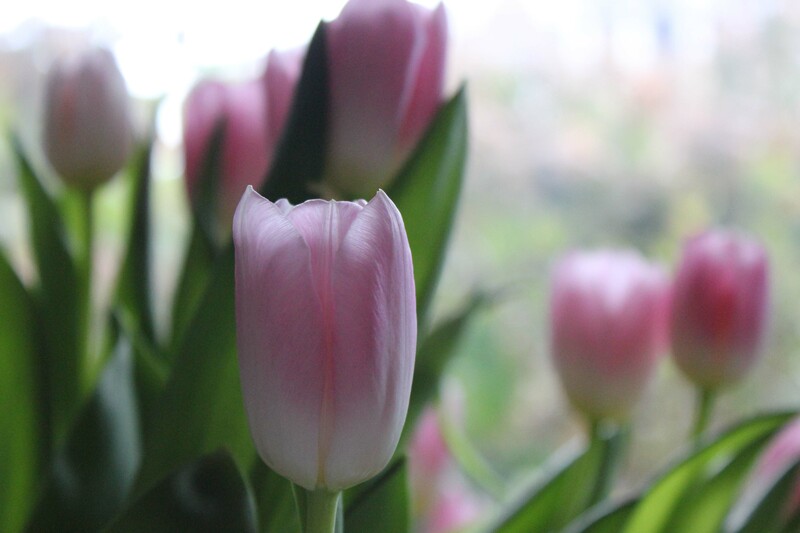 And just as I was beginning to regret the eradication of pink, Sarah and Brian have dropped round with a huge bunch of pale pink tulips for my birthday weekend. Their unseasonal presence on the dining table has coincided with the changing colour of the hydrangeas outside the window, which are now fulfilling the role of the old pieris by providing a sympathetic matching backdrop. That’s sad that the Pieris died. I thought it lovely even though you may not have preferred the color. That Tulipa Madonna is something to behold. Wow. I’m growing Narcissi Thalia also. This was their first year to bloom in my garden. I like them a lot. I actually learned to love the pink, but unlike yours, this garden is tiny, so I find it difficult to accommodate too much colour! So the Thalia are perfect. I’ll let you know how Madonna performs. BTW, have you come up with ideas for the big slab of concrete? I’ve been giving it some thought but not sure I’ve come up with anything yet. Apologies if you’ve blogged about this and I’ve missed it. Things have been a little complicated recently and I’ve not had time to dip into the blog world!